Business Systems & Consultants is a forty-two year old material storage solutions company out of Birmingham, Alabama. We have offices throughout the state of TN including East TN, Central TN (Nashville area) and West TN. Many manufacturing companies have utilized our material handling solutions in East Tennessee and other regions for decades. Throughout the Knoxville, TN area our sales representatives have helped those industries including: automotive manufacturers, pharmaceutical companies, food and beverage warehouses, government correction centers, manufacturing plants, military bases, and more. What are In Plant Offices for material handling solution purposes? 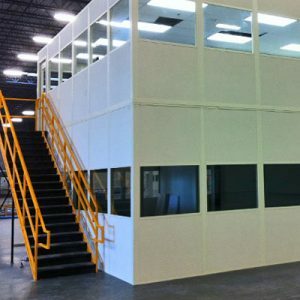 First of all, In Plant offices are modular buildings that are prefabricated and consist of a room, sometimes more than one room or floor, that are installed in an existing building to allow more office space or new office space for employees or items. Most often, the modular system can be fully installed and wired without disruption to other operations in place. Some of the most common places for In Plant offices would be: plants, warehouses, manufacturing facilities, clean rooms, commercial offices, automotive facilities, distribution industries, food and beverage industries, and military bases or offices. We offer space planning, design recommendations and drawings, site visits and field measurements, installation, warranty, all in one turn key solutions, and great leasing options. We want companies to feel comfortable and happy about a major purchase and with our guidance we can help bring the proper security and efficiency to your company. 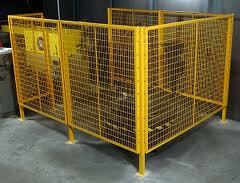 What are Wire Mesh Partitions for material handling solution purposes? Often called wire caging, they are designed to prohibit foot traffic by providing security and protection from theft in all types of environments. Where Can Wire Mesh Partitions Be Applied? Wondering if your industry could be included in this list? Contact us for more details! As these products bring many benefits to endless industries some we see stand out include: the prevention of access to specific areas, the prevention of access to sensitive items, theft protection, detaining items or individuals, and security for major items such as weapons, ammo, devices, and materials. 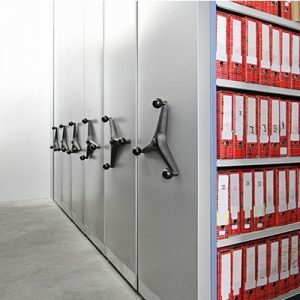 High density shelving is sometimes referred to as sliding mobile shelving, rolling files, movable lateral shelving, bi-file shelving, or spacesaver shelving. It is a cost effective storage solution that reduces the footprint of space needed to store items on shelving attached to carriages with collapsible aisle ways. It generally works best for small to medium size applications. Where Can These Products Be Applied? What Can These High Density Shelving Systems Store? As these shelving systems become more and more compatible with different products, we’ve seen how successful they can be when used with electronics, freezer storage, cooler storage, Health care (medical supplies, pharmacies, surgical supplies, linens storage, HIM, record boxes), maintenance parts, military & law enforcement weapons and gear, large and bulky industrial pallets, property and evidence, museum cabinets, archival boxes, historical books, specimens, framed art racks, football helmets, shoulder pads, jerseys, file folders, notebook binders, office supplies, file boxes, library books, laptops, tablets, and more. As you can see, the possibilities are nearly endless. As we know, these shelving systems can store just about anything. So how does this benefit you? They reduce your storage floor space by half your storage in exact footprint as stationary shelves. Mobile shelving can be relocated and modified as needed down the road. This creates extra space for revenue-based activities, such as production lines or work stations for personnel. High density shelving allows you to bring items stored offsite back onsite. Mobile shelving can store anything from microchips to small engines. This reduces energy operating costs to power and maintain your offsite building or lease space building. 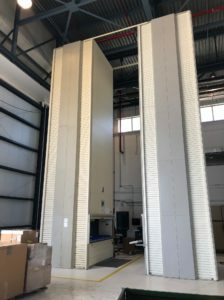 Shelving systems can eliminate new construction as well as the costs concurred with down time associated with new construction projects for additional needed space. It allows you to centralize storage in a single place to improve the flows of goods and make it faster for employees to retrieve materials. High density shelving brings security features to help reduce entry by unauthorized staff. They increase employee morale and productivity. The selection of colors and finishes makes it easier to bring the coordination of your current work place together. Automated storage systems are a storage cabinet that securely and efficiently store assets in a compact footprint. The compact storage system allows a single user to retrieve items quickly on demand from a central location. One model is a vertical carousel and is known as the shelf and tray picking technology method. The carousel has been around for decades and is a series of carriers connected to a chain drive system with motors to power the carriers in a vertical loop making the shortest route for item retrieval. You can say it’s the same method as a ferris wheel for a better picture. often referred to as a lean lean. The vertical lift is the most flexible system that store all different size items and is adaptable to inventory change. The trays can hold bulky and more heavy duty items. The automated storage and retrieval system consists of columns of trays with an extractor that consists of a chain and motor driven in the center aisle pulling the pans. Some of these systems have saved customers up to 85% off because of the maximization of storage density allowing the trays to be inches apart. What Are Common Applications For This System? Applications can consist of small part inventories, maintenance and repair parts, automotive parts, large tools, die kits, manufacturing, distribution, operating rooms and central supply, medical records offices, government facilities, and more. Other common applications include: storage, kitting, order picking, consolidation, assembly, tools/dies/molds, replenishment and returns, maintenance and repair parts, high value items, retail and service centers, and controlled environments. 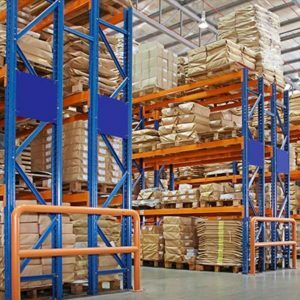 Pallet racking is a single or even multi-level storage system used to support high stacking items on palletized loads, Pallet racking is often seen in distribution, storage building or material handling operation areas. Pallet Rack offers quick access to stored materials. Pallet racks consists of upright posts and horizontal beams designed for specific sized loads needing to be stored. What Are Some Applications Affiliated With Pallet Racking? Some applications include: manufacturing, warehouses, educational facilities, back/storage areas, automotive plants, industrial buildings, and retail facilities. Does BSC Reach Your Location? We have locations throughout the state of TN with our solutions in cities and towns including: Morristown, TN; Mountain City, TN; Chattanooga, TN; Knoxville, TN; Johnson City, TN; Kingsport, TN; Greenville, TN; Rogersville, TN; Jefferson City, TN; Oak Ridge, TN; Maryville, TN; Pigeon Forge, TN; Sevierville, TN; Gatlinburg, TN; Athens, TN; Cleveland, TN; Dayton, TN; Crossville, TN; Sparta, TN; Cookeville, TN; Livingston, TN; Smithville, TN; McMinnville, TN; Manchester, TN; Tullahoma, TN; Lebanon, TN; and more. Keep in mind this is based in Tennessee solely for this blogs purpose. We help businesses all across the southeast region including, MS, AR, FL, AL, and TN. If you think you could benefit from our solutions and services but don’t think we reach your region check out our locations page to get all the details of specific states and cities we work in. Would you like a complimentary storage analysis? Contact 205-988-3300 to schedule a time for a storage expert to come onsite.